Over the last few years, interest in ecology and the environment has grown apace. Expressions such as ‘global warming’ have become part of everyday life, and politicians fall over each other to be ‘greener than thou’. As with other aspects of life under capitalism, Socialists have vital and distinct things to say on ecological issues. Moreover, many Greens have begun to see through the profit motive and may well be susceptible to Socialist ideas. Making meaningful contributions on these subjects, however, requires Socialists to be aware of the issues at stake and the claims that are made. It is the purpose of this Study Guide to enable Party members to become better informed on green politics and so to put the Socialist case on ecology more effectively. This purpose is addressed in three ways (1) providing some basic factual information; (2) supplying details of how to acquire further information; and (3) giving some questions to think about. The most important Party publication on green politics is the pamphlet Ecology and Socialism (1990). This provides a detailed and original account of human intervention in the ecosystem, of the emergence of class society, and of how capitalism’s economic priorities prevent proper attention being paid to ecological considerations. Production for need, in contrast, can be the basis for a sustainable relationship between humans and the rest of nature. Also very relevant is the pamphlet Socialism as a Practical Alternative (1987). This gives a well worked-out description of the workings of a Socialist society, showing how the waste of capitalism could be avoided, and how resources can be husbanded, via the practice of ‘conservation production’. Some earlier pamphlets are well worth reading Questions of the Day (1978) contains a good discussion of overpopulation, for instance. 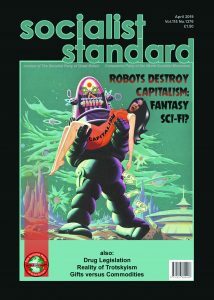 Many issues of the Socialist Standard also have relevant articles, e.g. June 1992 special issue on the ‘Earth Summit’KL. Winter 1987-8 (no. 7) food adulteration, and pollution. Capitalist production, by collecting the population in great centres, and causing an ever-increasing preponderance of town population, on the one hand concentrates the historical motive power of society; on the other hand, it disturbs the circulation of matter between man and the soil, i.e. prevents the return to the soil of its elements consumed by man in the form of food and clothing; it therefore violates the conditions necessary to lasting fertility of the soil. By this action it destroys at the same time the health of the town labourer and the intellectual life of the rural labourer. all progress in capitalistic agriculture is a progress in the art, not only of robbing the labourer, but of robbing the soil; all progress in increasing the fertility of the soil for a given time, is a progress towards ruining the lasting sources of that fertility. The more a country starts its development on the foundation of modern industry, like the United States, for example, the more rapid is this process of destruction. Capitalist production, therefore, develops technology, and the combining together of various processes into a social whole, only by sapping the original sources of all wealth- – the soil and the labourer. The influence of such views can be seen, for instance, in William Morris’ News from Nowhere, where London is virtually semi-rural -– and Manchester no longer exists. let us not flatter ourselves overmuch for our human victories over nature. For every such victory it takes its revenge on us. Indeed, each in the first place brings about the consequences on which we counted, but in the second and third place it has quite different, unforeseen effects which only too often cancel out the first ones… At every step we are reminded that we by no means rule over nature like a conqueror over a foreign people, like someone standing outside nature -– but that we with flesh, blood and brain belong to nature and exist in its midst, and that all our mastery of it consists in the fact that we have the advantage over all other creatures of being able to know and correctly apply its laws. This view is remarkable for its time, and remains valid today. The Green Party changed its name from the Ecology Party in 1985, having been founded in 1973. Its high point in electoral terms was the May 1989 European election, in which Green candidates received 2.3 million votes (= 15% of the votes cast); in the 1992 General Election, Green candidates received just 1.3% of the votes cast in the constituencies where they stood. Membership is currently around 10 thousand. The failure to grow in the aftermath of the European election result has led to many strains in the party. Former prominent member Jonathon Porritt, for instance, recently described the Greens as indulging in political fantasy, claiming that they have a “wholly irrational abhorrence of political leadership”. Some of the more radical members have been dismissed by others as ‘impossibilists’. An inner-party faction called Green 2000 has been advocating a more centralized and hierarchical organisation of the party, and their proposals were accepted at the 1991 annual conference, leading to a ‘relaunch’ of the party in January 1992. Opponents have claimed that these constitutional changes were steamrollered through undemocratically. It may be that the Green Party is heading for a split over this issue. Most parts of the world have Green Parties (or, at least, Green-based political movements). The best-known, and most electorally successful of these, are Die Grünen (‘the Greens’) in Germany. The present account is concerned with the Green Party in Britain, but the other parties share the same basic views. A description of the Greens in other countries can be found in chapter 1 of the book by Kemp and Wall (see below). It is important to appreciate that the Green Party is not just an environmental party they have policies on a whole range of issues, and emphasise the interconnectedness of ecological problems and other aspects of the way people live. Green Party publications state that the Green Party acknowledges the importance of attacking causes not symptoms, and sees profit as currently taking priority over human need. The ‘grey’ parties (Labour, Tory, Liberal Democrat, etc.) are basically the same as each other, for they all stand for a profit- and growth-oriented system. In contrast, the Greens advocate a society based on cooperation and production for use, a sustainable society where production is in harmony with the environment and affairs are run in a decentralised and democratic manner. Only in such a system can ecological problems such as pollution and global warming be solved. However, it is perfectly clear that this sustainable society is not Socialism, for the continuance of money and the market is assumed, together with private ownership. The ultimate aim is a ‘participatory economy’, based on smaller-scale enterprise, with a greatly-reduced dependence on the world market. This will involve a steady-state economy based on maximum conservation of materials and energy; and one element is a drastic reduction of population to a level which can be maintained without increasing. For instance, a population of around 30 million has sometimes been mentioned as appropriate for Great Britain (as opposed to the current 57 million). Population growth is seen as the greatest long-term threat to achieving ecological stability. Besides their long-term aims, the Greens also advocate a number of interim reforms, such as a Basic Income Scheme, payable to all and ensuring a certain minimum income for everyone, whether employed or not. Taxation should be used to encourage activities favourable to an ecological society, e.g. by imposing high taxes on the use of fossil fuels and so discouraging their use. Only community banks, not private banks, should be entitled to ‘create money’ (i.e. the myth of banks creating credit is swallowed). The Green Party’s ideas, then, are an uneasy mixture of petty reforms and a sometimes quite radical critique of production for profit. Unfortunately, this critique is not applied consistently, and even their long-term aims are firmly wedded to a form of capitalism. It is partly the strains between their ultimate goal and their short-term reformist policies that account for their recent internal bickerings. Nevertheless, their concern with how society can be organised so as to satisfy human needs and serve ecological ends must lead them to ask more probing political questions than (say) the Labour Party can. The best sources for Green Party policies are the various manifestos they issue for General and European Elections. A more detailed, but far less readable, account of their principles and policies is the pamphlet Manifesto for a Sustainable Society, which is regularly updated. David Icke It Doesn’t Have To Be Like This. Green Print 1990. Penny Kemp & Derek Wall A Green Manifesto for the 1990s. Penguin 1990. Jonathon Porritt Seeing Green. Blackwell 1984. The magazine New Internationalist (which should be available in good public libraries) devotes each monthly issue to a single theme. The May 1987 issue contained a good overview of green politics. May, July & September 1990. 1. Are the Greens correct in the importance they attach to population growth? 2. Is it conceivable that a Socialist society might need to control population growth? 3. Why would the Green Party’s policies fail to make capitalism into an eco-friendly social system? Pollution is probably the best-known and longest-recognised example of the impact of human activity on the environment. The release of dangerous, dirty or just plain unpleasant substances has long been a target of environmental campaigners, if only because of its immediate and obvious consequences. Pollution can be divided into at least the following categories pollution of water, land and air. Many industries simply dump waste products in the nearest river, rendering it a source of disease and poison. A further result is that much of this waste eventually finds its way to the sea, and many seas have become the victims of extraordinarily complex mixtures of pollution. For instance, as much as a million tons of oil finds its way into the Mediterranean each year. Human waste, too, is frequently dumped untreated in the nearest lake or sea. Pollution has horrendous effects on marine and river life, and on the availability of safe drinking water. Even under capitalism, governments have realised that some form of cooperation is needed to fight such problems, and have set up organisations such as the Mediterranean Action Plan (though this may just be out a wish to keep the beaches clean for the tourists and their dollars). Waste materials from industry also pollute the land, but a particular problem is caused by the use of pesticides. While they may be intended to increase food supplies (or, more accurately, to increase profits), they kill many animals in addition to the pests they are aimed at, and may interact to produce especially toxic combinations. It is estimated that over 200,000 deaths per year are due to pesticide poisoning – most of these deaths are in Third World countries, where many pesticides banned in industrial countries are still used. Pollution of the air also takes many forms (see the sections below on global warming and the ozone layer). In 1952, smog killed 4,000 people in a three-week period in London, and mixtures of toxic fumes and car exhausts still present horrendous problems – and not just in cities like Athens and Mexico City. Acid rain, i.e. rainfall which has been made strongly acidic by pollution from factories and exhausts, and which may originate hundreds of miles from where the rainfall occurs, also destroys forests; half of the forests in Germany had been damaged by acid rain by 1984. In addition, acid rain helps to release further poisonous chemicals into the water supply. It is obvious that the cause of pollution is capitalism’s need for profits, specifically its need to keep the costs of production as low as possible. Producers have no interest in disposing of waste and so on in a sensible way, though they will often see anti-pollution legislation as a way of hampering their smaller or less efficient competitors. The unplanned nature of capitalism and the drive for profits make ecologically-oriented production an impossibility. Socialism will ensure that waste products are properly treated, and that pollution is reduced to an absolute minimum. R. Carson Silent Spring. Penguin 1982. Pollution is discussed in, among others, the April 1989 Socialist Standard. 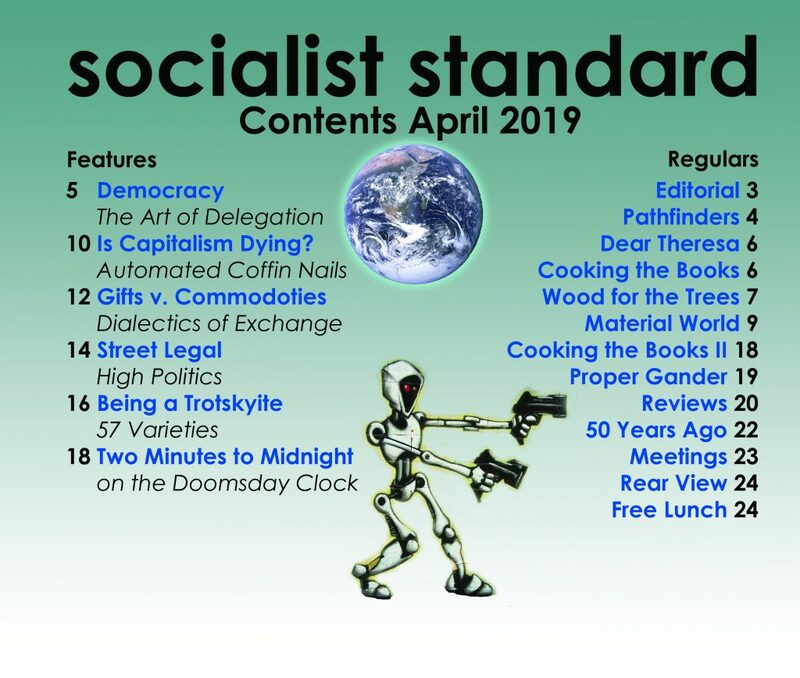 See also the two issues of the World Socialist (nos. 4 & 7) mentioned earlier. March 1986 (on pollution and ‘affluence’), May 1990 (on water). 1. How could a Socialist society go about clearing up the mess of the world’s oceans? 2. Is a pollution-free social system possible? The term ‘global warming’ refers to a slow but consistent increase in average world temperatures. Although some scientists cast doubt on the figures, it is generally accepted that the 1980s were around one degree Celsius warmer than the 1880s, and contained the six warmest years of the century. These are global averages, and some places, including Britain, probably got a little cooler between the mid-1970s and mid-1980s. The increases may seem very small, but it should be noted that the last Ice Age was only four to five degrees colder than now; small changes in temperature can have very large consequences. Predictions about the future course of world temperatures must be treated skeptically, if only because less than twenty years ago there were widespread claims of global cooling! But it is often claimed that even on the most optimistic view, temperatures will increase by 1.5 degrees by 2050 (and pessimistic views at least double this figure). The consequences of warming are many and varied, and some may be here already droughts in the US and north Africa may well be due to temperature increases, though it is impossible to isolate a single cause. Overall, however, a rise in temperature is likely to mean more rainfall, but largely in temperate zones. Some areas may benefit from the longer growing seasons caused by warming, but in others drought will lead to a drastic fall in crop yields. The Antarctic ice-cap may partly melt, but it is the expansion of water when it warms that is the main reason why sea level is likely to rise by at least 30 centimetres (maybe far more) by 2030, flooding many coastal areas (e.g the Nile delta). The rise in sea level could also mean contamination of drinking water and the spread of water-borne diseases. Hurricanes are likely to become both stronger and more frequent. Forests in temperate zones may be partially destroyed, thus leading to more warming (see below). The general change in the world’s climate will be too fast for many forms of vegetation to cope with, causing them to die out. If people move in large numbers to cooler, wetter areas, there will be vast social changes to cope with. In summary, global warming means not just sultrier summers but droughts, drop in agricultural production, loss of vegetation, rise in sea level, increased pollution, and possibly big population movements. The basic cause of global warming is the Greenhouse Effect, whereby a number of greenhouse gases in the earth’s atmosphere allow sunlight to enter but do not allow the heat reflected back from the ground to escape. Thus the heat is trapped in the atmosphere and the planet becomes warmer. Without the greenhouse gases, Earth would be about 35 degrees colder than it in fact is, and life would be impossible (as it is on the Moon, which has no atmosphere at all). However, it appears that over the last couple of centuries, the amount of greenhouse gases in the atmosphere has increased quite drastically, leading to even more heat being trapped and the temperature rising to give what is now recognised as global warming. The main greenhouse gas is carbon dioxide (CO2); it is estimated that since the late eighteenth century the concentration of carbon dioxide in the atmosphere has increased by around 25%. This increase is partly due to the chopping-down of forests, but mostly to the burning of fossil fuels (i.e. coal, oil, gas and lignite, which release carbon dioxide when burned). These CO2 emissions are responsible for about half of the Greenhouse Effect, but there are other important greenhouse gases too methane, nitrous oxide and ozone. CFCs also contribute to global warming, separately from their effect on the ozone layer (see below). Deforestation is relevant in that trees absorb carbon, and fewer trees means more carbon is around to form CO2 and so add to the Greenhouse Effect. It would hardly be desirable to do away with the Greenhouse Effect entirely, but we can ask whether it is possible to stop or reverse the current global warming trend. Clearly the answer is to drastically reduce the emission of greenhouse gases, but this is easier said than done. Unlike CFCs, for which substitutes are readily available (even if not profitable to introduce), processes which produce greenhouse gases cannot be simply abandoned or drastically modified. The section on energy below discusses the possibility of reducing the use of fossil fuels. One claim is that CO2 emissions must be cut by at least 50% in order to lessen the rate of warming to 0.1˚ per decade, which will be more manageable as far as natural ecosystems are concerned. S. Boyle & J. Ardill The Greenhouse Effect. New English Library 1989. F. Pearce Turning Up the Heat. Paladin 1989. 1. Is global warming caused by industrial production or by the profit motive? 2. Would the establishment of Socialism automatically solve the problem of global warming? 3. In a Socialist society, what criteria would be used to decide whether or not to follow productive practices which delivered useful goods or services but contributed to global warming? We have seen that global warming involves an increase in greenhouse gases, such as carbon dioxide, in the atmosphere. Another much-publicised ecological threat, depletion of the ozone layer, is also caused by an increase in emission of certain gases. The ozone layer is also known as the stratosphere, the part of the atmosphere between about 15 and 50 km above the earth’s surface. Ozone is formed when the oxygen emitted by living things reacts with ultra-violet light, and ozone molecules break apart when they encounter other forms of ultra-violet. Generally, the formation and destruction of ozone balance each other out. The importance of the ozone layer is that it absorbs a great deal of dangerous solar radiation which would otherwise reach the ground. It seems clear that the amount of ozone in the stratosphere has been reduced over recent years -– some accounts claim that half the ozone layer has been destroyed. The hole in the ozone layer was first detected over the Antarctic, but recent reports indicate that there has now been a massive reduction in ozone over Europe and North America. Depletion of the ozone layer, then, will mean an increase in the amount of ultra-violet radiation reaching the earth. Likely consequences of this include an increase in skin cancers and various other infections. Many plants and domesticated food animals will suffer too. The real interaction between depletion of the ozone layer and global warming is controversial, and some recent reports suggest that ‘holes’ in the ozone layer allow more heat to escape, thus damping down the Greenhouse Effect. But at the very least, the two phenomena may interact in complex ways which makes predicting the future course of either very difficult. The cause of ozone depletion is emission of human-made gases, chlorofluorocarbons (CFCs), which sets off a chain of reactions resulting in reduction in the amount of ozone. CFCs were developed in the 1920s, and have been employed in a range of uses in refrigerators, as propellants in spray cans, in disposable coffee cups, etc. It was not until the 1970s that people began to realise that CFCs might be creating problems, and to appreciate the significance of the fact that all the CFCs released stayed in the atmosphere without being broken down, and eventually found their way to the stratosphere, where their significance for the ozone layer was gradually comprehended. Technically, it is quite possible to find substitutes for CFCs. In fact, governments have got together, in the Montreal Protocol of 1987, to enforce various reductions in CFC production and consumption (e.g. a cut in CFC production by 1999 to 65% of the 1986 figure). These reductions are both gradual and rather slight; also, they fail to address the point that previously-released CFCs will hang around for over 100 years doing their environmental damage. In fact, the amount of CFCs in the atmosphere is likely to increase during the remaining years of this century. The reason for this comparative lack of action, of course, is concern about the cost and disruption of introducing a wide range of substitutes for CFCs. Agreements which bound (and so handicapped) some countries would be hard to enforce against others. J. Gribbin The Hole in the Sky. Corgi 1988. Also see the article in the Socialist Standard, February 1989. 1. Would capitalism or socialism be better able to cope with the effects of depletion of the ozone layer? As we saw in the section on global warming, burning of fossil fuels makes a big contribution to this by releasing CO2; it also results in emission of sulphur and other atmospheric pollutants. It is clear that a massive advance in humanity’s treatment of the ecosphere could be made by adopting more environmentally-friendly means of energy supply. In practice, this means making use of renewable energy sources, i.e. sources which are not simply burnt and then become no longer available but which are continually being replenished. Such sources mostly tap the natural ambient energy emanating from the sun. Many such sources exist, providing the potentiality of abundance of energy being available for as long as it is needed. All energy sources have environmental impact, and some renewable sources can have a drastic impact, especially hydroelectric schemes (e.g. the vast dams in Brazil, which have flooded immense areas of land); but small-scale turbines in rivers and streams can be used with little disturbance. Wind turbines and tidal barrages are also potentially important for producing electricity. Solar heating can be used to provide heat directly, as can the burning of biomass (various kinds of vegetation). Geothermal energy, tapping heat stored inside the earth, is another possibility. All in all, there are many potential sources of renewable energy. Different ones are applicable in different areas, and there is likely to be enough energy available from such sources to replace the current reliance on fossil fuels – though it certainly does not do to be naively optimistic in such matters. Besides its use in providing heating, lighting and other kinds of power, energy is also essential in transport. Private cars, burning petrol and emitting CO2, have a very bad environmental impact. In a Socialist society, there would presumably be far less private transport, and far more public transport, with electrically-powered buses and trains playing a major part. Gas can also be used to replace petrol. There are two reasons why renewable sources are not used today as much as they could be. Firstly, there is concern over the cost and economic viability of such supplies. Secondly, relatively few resources are put into researching and developing renewable sources. Rather, a vast amount of money and effort is put into developing nuclear energy – which has sometimes been trumpeted as a safe and clean alternative to burning fossil fuels. In fact, nuclear power is anything but safe, to say nothing of its reliance on strictly limited supplies of uranium. All in all, the enormous rise in living standards for the majority of the world’s population which is entailed by the establishment of Socialism is certain to mean a great increase in energy consumption. Even if Socialism is far less wasteful than capitalism, it will still follow that new energy sources will have to be found, and research into this area will presumably be a priority. Besides new sources of energy, more efficient consumption of energy will be an important step, with more of the energy supplied in some process being delivered as useful energy at the end. W. Patterson The Energy Alternative. Optima 1991. 1. How true is it that renewable energy sources really could replace all the current ecologically-damaging ones? 2. What might happen if people in a Socialist society insisted on continued use of private cars? 3. Is it essential for Socialists to show now that Socialism could solve the energy problem? In the section on global warming we mentioned that deforestation adds to the Greenhouse Effect; we can now look at other aspects of the treatment of forests. Forests vary in their make-up according to the climate they occur in, and the tropical rainforests are the main focus of current ecological concern, though deforestation applies to other types too. The world’s largest tropical forest is in the Amazon; various other areas of South America, Africa and South and South-East Asia also have large rainforests. The tropical forests are gradually being destroyed in 1950, 30% of the earth was covered by tropical forest, but by 1975 only 12%. Deforestation often takes the form of simply burning the forest so as to clear it and replace it by pasture land – which usually becomes unusable after only a few years. Or the forest may be depleted through logging, which only rarely involves replacement of the lost trees. Such deforestation is usually a catastrophe for those who live in the forest, who may be forcibly removed from the land they occupy, and even murdered. In addition, tropical forests contain vast numbers of plant and animal species which may well be found nowhere else on earth. These species may have great pharmaceutical value, which will be lost for good if they become extinct. Forests also protect the soil from erosion, and help prevent droughts and flooding. Desertification – the formation of deserts – is the ultimate consequence the Sahara is the result of desertification starting in Roman times, and is still expanding, while the Gobi desert in China is another outcome of human productive activity. Parts of the Amazon Basin are becoming desert-like today, while in all about one-third of the earth’s land surface is threatened with desertification. The misuse of land leading to formation of deserts inevitably makes any droughts which occur more lethal in their impact. The causes of deforestation are naturally to be sought in the profit motive which inspires those responsible. The Amazon suffered in the nineteenth century from the rubber industry, and more recently from Brazilian government plans for the development of the region. Such development is partly undertaken to pay off foreign debt. In the Congo, the World Bank is planning to fund logging operations and so boost the country’s timber trade for export. The Solomon Islands, among other places, have been almost denuded of forests through logging. Quite apart from such deliberate acts, forests are also harmed by acid rain (see the section on pollution above). The solution to all these problems is fairly straightforward forests, like all parts of the ecosphere, have to be treated with care and with due regard to the consequences of any actions taken. Clearly a Socialist society would halt the destruction of forests, and would probably go in for a policy of reforestation. K. Miller & L. Tangley Trees of Life. Beacon Press 1991. S. Hecht & A. Cockburn The Fate of the Forest. Penguin 1990. June 1988 (on forests), May 1991 (on the Amazon). 1. What attitude should Socialists take to the ‘native peoples’ of the rainforests? Should we defend their current way of life? 2. Does the destruction of previously unknown animal and plant species really matter? 3. Could the worst effects of deforestation and desertification be reversed? E. Schumacher Small is Beautiful. Abacus 1974. Despite its reputation, and the fact that it is often cited by Greens, this is actually a rather boring book, though it does have a few worthwhile things to say on the limitations of the profit motive and the use of suitable technology. J. Lovelock Gaia. Oxford University Press 1979; and The Ages of Gaia. Oxford University Press 1989. Lovelock is the originator of the Gaia Hypothesis, according to which the earth’s surface, atmosphere and oceans have been converted into a liveable environment by life itself, rather than life adapting to the environment. The earth is in fact seen as a single vast organism which can defend itself against attack. It would be interesting to consider what implications this hypothesis has for the Socialist case. K. Pedler The Quest for Gaia. Paladin 1981. Suggests how to adopt a life-style in keeping with ecological concerns (e.g. take showers not baths, don’t use a freezer). M. Bookchin Post-Scarcity Anarchism. Wildwood House 1974; and Toward an Ecological Society. Black Rose 1980. Bookchin is an anarchist writer who has interesting things to say on a variety of topics, including ecology. ‘Ecology and revolutionary thought’ and ‘Towards a liberatory technology’ in the first book, and the essays in the second, discuss what an ecologically-oriented society could be like. 1. Some free-market economists accept that the market on its own cannot reduce or solve pollution and other environmental problems. How would you answer the argument in the following passages (from Freedom to Choose, by Milton & Rose Friedman)? In the case of pollution, the devil blamed is typically ‘business,’ the enterprises that produce goods and services. In fact, the people responsible for pollution are consumers, not producers. They create, as it were, a demand for pollution. 2. How would you reply to a Green who argued that, since in 20 or so years the state of the environment will be far worse than today, the problems of the ecosphere are so urgent that everything possible must be done now, and that the struggle for Socialism must be put off for the time being? 3.Does emphasis on the ecological side of the case for Socialism in any way imply less stress on the conception of Socialism as the solution to the problem of working-class poverty and exploitation? (b) clearing up or removing the catastrophic results of capitalism? Would it be reasonable to conclude that (a) is a more manageable task than (b)?